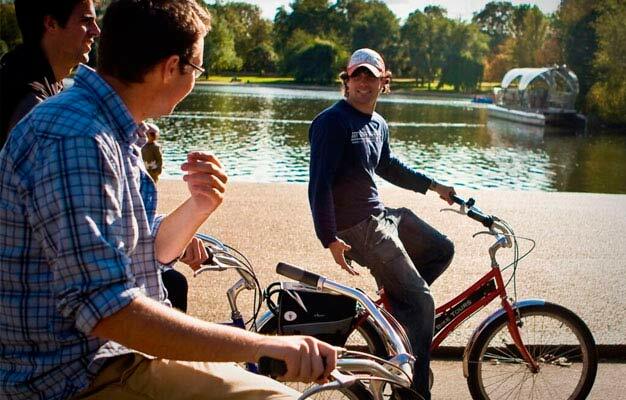 Regardless if you're new to London or you already know all of the words to ‘God Save The Queen', this guided bike tour has something for you! Whether it's about Kings, Queens and Princesses; palaces, parks and parliament, or battles and their heroes and villains, our knowledgeable tour guides will entertain you with the most fascinating and often downright absurd stories about London. Our comfortable bikes and smooth route make cycling between sites fun and undemanding. Halfway through your bike tour, we'll take a break around Trafalgar Square where you can go your own way for half an hour and regroup at the cornerstone of our culture: A traditional English pub (not included) - the perfect opportunity to chat to the rest of the group or get the latest London tips from your guide. During your tour, you'll see: The Houses of Parliament, Buckingham Palace, Westminster Abbey, The Royal Parks, Big Ben, Kensington Palace, Trafalgar Square and much more. The tour starts outside of Queensway Underground Station. Please be there 15 minutes before your tour starts. The tour departs at 11 AM. Additional tours at 3:30 PM (May-September).